(Originally published on Dec. 15, 2016) All too often these days, big moments from movie trailers don't make it into the final cut. Given the many rumors that "Rogue One: A Star Wars Story" was extensively rewritten and reshot earlier this year, it's not entirely surprising that some pieces from the initial production are missing from the final cut. We've gathered up all the big moments from Disney's marketing that didn't make it into "Rogue One" -- including this shot here from the behind-the-scenes sizzle reel they released at Star Wars Celebration in July. 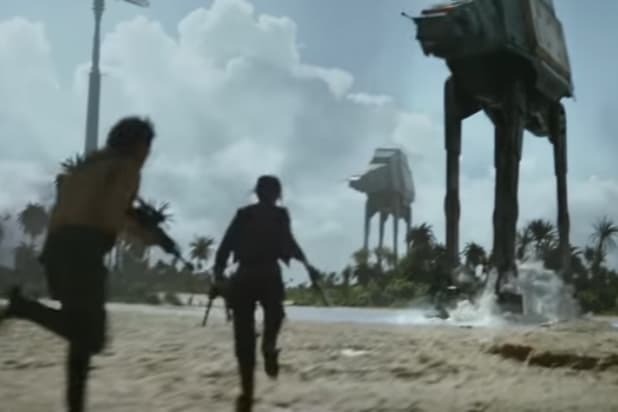 Let's get the big one out of the way first: this incredible shot of our heroes sprinting across the beach on the planet Scarif with the Death Star plans -- that's what Jyn Erso (Felicity Jones) is holding in her left hand there -- is nowhere to be found in "Rogue One." Which is interesting because this shot is still being used in TV spots today, even though in the final cut neither Jyn nor Cassian (Diego Luna) fight on the ground at all on Scarif. 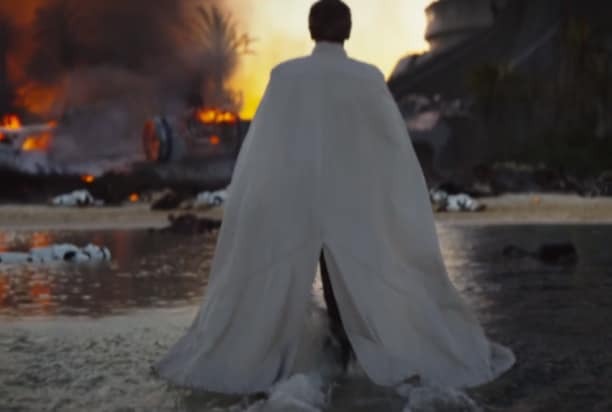 This gorgeous wide shot of Director Krennic (Ben Mendelsohn) surveying the aftermath of an Imperial defeat, seen in the first teaser, has been cut from the film. Krennic never makes it onto the ground on Scarif during or after the fighting. "They destroyed our home," Baze Malbus (Jiang Wen), says before firing on the enemy on the rainy planet of Edu in the first full "Rogue One" trailer. Not so in the final cut of "Rogue One," where Malbus wordlessly snipes the baddies after he and Chirrut (Donnie Yen) wander into the battle to find Jyn. Despite this epic trailer shot, Jyn never has to face a TIE fighter head-on as it dramatically creeps up on her while she stands atop the Imperial base on Scarif. Instead, an Imperial fighter swoops in from the side, firing on her from afar, before Director Krennic enters the picture. "The Captain says you are a friend. I will not kill you." Though there are many incredible and biting one-liners that will make the former Imperial droid K2-SO (voiced by Alan Tudyk) a fan favorite, this one, from the first full trailer, was cut from the film. Likewise, K2-SO's "There's a 97.6 percent chance of failure" line from later in that same trailer is also MIA. This shot, shown at Star Wars Celebration, announced Darth Vader's appearance in "Rogue One" -- but it also isn't in the film. Another epic Jyn moment removed from the film was actually one of the film's more popular promotional shots, featuring her in disguise on the Scarif Imperial base. 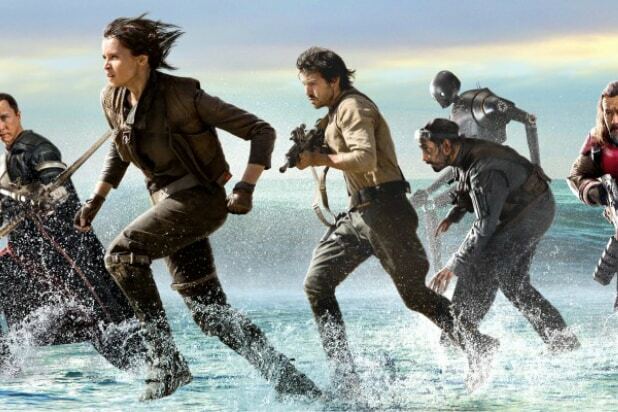 Despite this being the header image on so many "Rogue One" articles this year, it's nowhere to be found in the finished movie. "This is a rebellion, isn't it? I rebel." Jyn's iconic line from the first teaser has made it on to shirts and has even become something of a punk rock motto among "Star Wars" fans. Unfortunately, it didn't find its way into the movie. In fact, it seems that most of what we saw of Jyn's meeting with Rebel leadership in that first teaser was removed. All of Mon Mothma's lines as she briefs Jyn on her mission are different in the final version of "Rogue One." This bit, in which Jyn, Cassian and K2-SO are sprinting through the Imperial base on Scarif in their civvies, is notably absent. Remember Saw Gererra's (Forest Whitaker) big "What will you become?" speech in the first teaser? Didn't make it into the final cut. And, oddly enough, it seems that his scenes were reshot to give him hair that he didn't have in the first trailer either. "The power that we are dealing with here is immeasurable." This emphatic line that Krennic utters during his meeting with Darth Vader is nowhere to be found in the final cut.